Dionysus or Dionysos (from the Ancient Greek Διώνυσος or Διόνυσος, associated with the Italic Liber), was the ancient Greek god of wine who represented the power of intoxication and ecstasy (literally "being outside the self"). He was known as the Liberator ("Eleutherios"), freeing one from one's normal self, through drunkenness, madness, or artistic expression. Paradoxically, he was also viewed as the promoter of civilization, a lawgiver, and lover of peace—as well as the patron deity of agriculture and the theatre. The divine mission of Dionysus was to bring an end to care and worry. Dionysus was an important figure in the religious imagination of the Greeks, as he was thought to represent the union between the realms of the living and the dead (as per the two mythic stories of his death and rebirth). Within the bulk of Greek mythology, Dionysus was described as the son of Zeus and Semele, though some other versions of the story suggested that he is the son of Zeus and Persephone. He was described as being womanly or "man-womanish". The variety of mythic and cultic attributes of Dionysus suggest to some that the mythographers were dealing with a god whose foreignness was inherent to his character. Indeed, Dionysus's name is found on Mycenean Linear B tablets as "DI-WO-NI-SO-JO", and Kerenyi traces him to Minoan Crete, where his Minoan name is unknown but his characteristic presence is recognizable. In general, the name Dionysus is of uncertain significance; it may well be non-Greek in origin, but it has been associated since antiquity with Zeus (genitive Dios) and with Nysa, which is either the nymph who nursed him or the mountain where he was raised. That he is himself a Thracian deity we are abundantly assured; but we know that the Thracians and Phrygians were closely allied races, and by good luck we know the Phrygian form of the god's name, Diounsis. Concerning the meaning of the name, since Thrako-Phrygian was … fairly akin to Greek, we can say with reasonable confidence that the first member contains the name of the sky-god, who was called in Phrygian Dios. As to the rest we are not so sure. A connexion with the legendary Nysa has been suggested; another and very ingenious theory is that there existed a word nyso-, akin to the Latin nurus, Greek γυός and that it meant 'child' or 'son'. Clearly, Dionysus had been with the Greeks and their predecessors a long time, and yet always retained the feel of something alien. Sculpture of Dionysus, commissioned to celebrate the 100th anniversary of Qingdao Beer. Qingdao Beer Museum, Qingdao city, Shandong province, China. The range of epithets attached to the wine god signify the breadth of associations that he possessed within the Hellenic milieu. Some of these included: Bromios, meaning "the thunderer" or "he of the loud shout"; Dendrites (Dionysus Dendrites), "he of the trees," a name which represented him as a powerful fertility god; Dithyrambos ("he of the double door"), which refers to him or to the solemn songs sung to him at festivals; Eleutherios ("the liberator"), an epithet for both Dionysus and Eros; Iacchus, possibly an epithet of Dionysus, which was associated with the Eleusinian Mysteries, as he was known as a son of Zeus and Demeter in Eleusis; Liknites ("he of the winnowing fan"), which referred to the god as fertility deity connected with the mystery religions; Oeneus, which represented his role as god of the wine-press. Other, more colorful titles for the god of fertility include the Samian Dionysus Enorches ("with balls" or perhaps "in the testicles" in reference to Zeus' sewing the babe Dionysus into his thigh, i.e., his testicles). In addition, Dionysus was known as Lyaeus ("he who releases") as a god of relaxation and freedom from worry. In the Greek pantheon, Dionysus (along with Zeus) absorbs the role of Sabazios, a Phrygian deity, whose name means "shatterer" and to whom shattered pottery was sacrificed (probably to prevent other pottery from being broken during firing). In the Roman pantheon, Sabazius became an alternate name for Bacchus. Unlike many of the other gods in the Olympian pantheon, tales of the Dionysus are relatively difficult to find—especially when taking the god's near-universal popularity. As Powell notes, "the myths of Dionysus must be pieced together from many different sources. Homer has little to say about him; the aristocratic epic poet lacked sympathy for this god of drunkenness and sexual license." Along with Athena (who emerged fully formed from her father's skull), Dionysus holds a place of honor for possessing two of the more peculiar origin stories in the mythic corpus of the ancient Greeks. The existence of these two equally well-established creation accounts is perhaps an indication of the difficulty that the early mythographers had incorporating the foreign wine-god into the pantheon. In it, his mother Semele, who was a mortal woman (daughter of the Phoenician king, Cadmus), catches the eye of the notoriously philandering Zeus. As in numerous other tales, Hera, the oft-betrayed wife of the Sky God, discovered the affair after the woman had become pregnant. Appearing to her as an old crone, Hera befriended Semele, who confided in her that her lover was actually Zeus. Hera pretended not to believe her, and planted the seeds of doubt in the princess's mind. Curious, Semele demanded of Zeus that he reveal himself in all his glory as proof of his godhood. Though Zeus begged her not to ask this, she persisted, eventually swearing an oath to force his compliance (much as Hera had hoped she would). Unfortunately for the young woman, it is impossible for a mortal to experience the true glory of a god. As a result, when her lover appeared in his natural form, wreathed in bolts of lightning and humming with the energy of a summer thunderhead, she perished in the ensuing blaze. Unwilling to allow all memory of this affair to perish, Zeus rescued the fetal Dionysus from the charred remains of his mother and sewed him into his thigh (or testicles). A few months later, Dionysus was born. This version explains the god's epithet Dimetor ("twice-born"), as he had been carried by two "mothers" (Semele and Zeus). In another version of the story, Dionysus was the son of Zeus and Persephone, the queen of the underworld. A jealous Hera again attempted to kill the child, this time by sending Titans to rip Dionysus to pieces after luring the baby away from his parents with toys and sweets. By the time the child's abduction had been discovered, the Titans had already eaten everything but the heart, which was saved, variously, by Athena, Rhea, or Demeter. In an attempt to harmonize this account with the mythic version described above, Zeus used the heart to recreate the child in the womb of Semele (who is misled into consuming it). The fact that, in both cases, the life of Dionysus begins with a death and rebirth speaks to the importance of such themes within the worship of the god (especially through the Mystery Religions). Given the precarious environment that Hera's jealous wrath created for the young god, Zeus felt it necessary to conceal the infant from the Divine Queen's machinations. While all accounts suggest that he gave the child to Hermes and instructed him to deliver it to safety, the particular destination(s) chosen by the messenger god vary considerably. One version of the story has Hermes taking the boy to King Athamas and his wife Ino, who were relatives of Semele. When depositing the child, Hermes bade the couple to raise him as a girl, in an attempt to conceal him from Hera's wrath. Another version is that Dionysus was taken to the rain-nymphs of Nysa, who nourished him in his infancy and childhood. For their care, Zeus rewarded them by catasterizing them into the Hyades among the stars. The responsibilities of caring for the young god are occasionally shared by the satyrs, especially Silenius, who remain strongly affiliated with the god in surviving myths and artwork. In some sources, the two accounts are woven together by suggesting that Hera discovered the child in the care of Athamas and Ino, and drove the royal couple mad. This necessitated brining the babe to the nymphs of Nysa. Intriguingly, the location of the storied mount where the nymphs nursed the young god has never been convincingly demonstrated: a fact that has allowed writers from numerous city-states (including Thebes, Euboea, Naxos, Sparta and Phrygia) to claim that Dionysus hailed from their region. 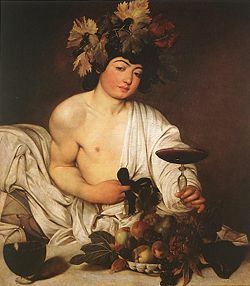 When Dionysus reached adulthood, he discovered the culture of the vine and the mode of extracting its precious (and intoxicating) juices; but Hera struck him with madness, and drove him forth a wanderer through various parts of the earth. In Phrygia, the goddess Cybele, better known to the Greeks as Rhea, cured him and taught him her religious rites, and he set out on a progress through Asia teaching people to cultivate the fruits of the vine. Such wanderings offer an etiological explanation for the god's relationship with Eastern cults.Returning in triumph, he undertook to introduce his worship into Greece, but was opposed by some princes who dreaded its introduction on account of the disorders and madness it brought with it (see King Pentheus or Lycurgus below). As a young man, Dionysus was exceptionally attractive. Once, while disguised as a mortal sitting beside the seashore, a few sailors spotted him, believing he was a prince. They attempted to kidnap him and sail him far away to sell for ransom or into slavery. They tried to bind him with ropes, but no type of rope could hold him. Dionysus turned into a fierce lion and unleashed a bear onboard, killing those he came into contact with. Those who jumped off the ship were mercifully turned into dolphins. 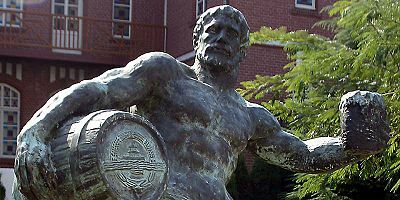 The only survivor was the helmsman, Acoetes, who had immediately recognized the gorgeous youth as a god and had tried to stop his sailors from their impiety. In a similar story, Dionysus desired to sail from Icaria to Naxos and, resultantly, decided to hire a Tyrrhenian pirate ship. But when the god was on board, they sailed not to Naxos but to Asia, intending to sell him as a slave. So Dionysus turned the mast and oars into snakes, and filled the vessel with ivy and the sound of flutes so that the sailors went mad, and leaping into the sea, were turned into dolphins. For more details on this topic, see Hephaestus. Given Hera's profound dislike for the young godling, it is perhaps surprising that he was ever permitted to join the ranks of the Olympians. However, their relationship was abruptly redefined when the queen of the gods was imprisoned by the smith god, Hephaestus. While none of the other gods were able to intercede on behalf of their beleaguered ruler, Dionysus appeared, spoke to the smith god about his (justifiable) grievances with Hera, and proceeded to ply him with alcohol. When suitably "lubricated," Hephaestus agreed to return to Olympus and to release Hera. When Vulcanus [Hephaistos, still living in exile after being cast from Olympos at birth] had made golden [thrones or sandals] for Jove [Zeus] and for the other gods, he made one of adamant [for Juno or Hera], and as soon as she sat down she suddenly found herself hanging in the air. When Vulcanus [Hephaistos] was summoned to free his mother whom he had bound, in anger because he had been thrown from Heaven, he denied that he had a mother. When Father Liber [Dionysos] had brought him back drunk to the council of the gods, he could not refuse this filial duty. In gratitude for his aid in this matter, Hera dropped her vendetta against the wine god and he was permitted to take up residence on Mt. Olympus. Euripides wrote a tale concerning the destructive nature of Dionysus in his play entitled The Bacchae. In this tragic drama, Dionysus returns to his birthplace, Thebes, a city-state ruled by his cousin, Pentheus. He wanted to exact revenge on the women of Thebes, his aunts Agave, Ino and Autonoe, and his cousin Pentheus, for not believing his mother Semele when she said she had been impregnated by Zeus (which had contributed to her ultimately fatal desire to see her suitor's true form), and for denying that Dionysus was a god and therefore not worshiping him. So, he travels to the city, accompanied by the Maenads, the assembled body of his female worshipers, whose worship involved ecstatic trances, and dismemberment and consumption of the flesh of animals. When the god reached Thebes, the women of the royal house abandoned their posts to join in the ecstatic worship of the Maenads. Simultaneously, Pentheus was slowly driven mad by the compelling Dionysus, and lured to the woods of Mount Cithaeron to experience the revels of the wine god firsthand. When the women spied Pentheus, they tore him to pieces like they did earlier in the play to a herd of cattle. In the brutal finale, his head is torn off by his mother Agave as he begs for his life. Only in the aftermath of this slaughter do the various members of the royal family discover the madness that they have been a party to. When King Lycurgus of Thrace heard that Dionysus was in his kingdom, he feared the destructive power of his cult, and decided to imprison all the Maenads (the female followers of Dionysus). Further, using an ox-goad, he attempted to attack and drive off the god himself. Dionysus fled, taking refuge with Thetis. In recompense for the mortal's hubris, Dionysus sent a drought to the land, which caused the people to revolt. Next, Dionysus drove King Lycurgus insane, after which point he sliced his own son into pieces with an axe, thinking he was a patch of ivy, a plant holy to Dionysus. Unsure of how to proceed, the Thracian people consulted an oracle, who informed them that the land would stay dry and barren as long as Lycurgus was alive. So, his people had him drawn and quartered. With Lycurgus dead, Dionysus lifted the curse. A more prominent tale is that of his descent to Hades to rescue his mother Semele, who (as described above) had passed away before the god's birth. He made the descent from a reputedly bottomless pool on the coast of the Argolid, near the prehistoric site of Lerna. He was guided by Prosymnus or Polymnus, who requested as his reward to be Dionysus' homosexual lover. Prosymnus died before Dionysus could honor his pledge, so in order to satisfy the shade of his erastes, the god fashioned a phallus from an olive branch and sat on it at Prosymnus' tomb. The Alkyonian Lake [near Nemea, Argos], through which the Argives say Dionysos went down to Haides to bring up Semele, adding that the descent here was shown him by Polymnos ... The nocturnal rites performed every year in honor of Dionysus I must not divulge to the world at large. Another pederastic myth of the god involves his eromenos, Ampelos, a beautiful satyr youth whom he loved dearly. According to Nonnus, Ampelos was killed riding a bull maddened by Ate's gadfly, as foreseen by the god. Fortunately, the Fates granted Ampelos a second life as a vine, from which Dionysus squeezed the first wine. Indeed, this myth could be seen as an explanation of the god's love for the intoxicating juice of the grape, as the satyr's name can be literally translated as "vine". When Theseus abandoned Ariadne sleeping on Naxos, some sources suggest that Dionysus found and married her. She bore him a son named Oenopion ("wine-faced"), but he committed suicide or was killed by Perseus. In some variants, he had her crown put into the heavens as the constellation Corona; in others, he descended into Hades to restore her to the gods on Olympus: "And golden-haired (khrysokomes) Dionysos made blonde-haired Ariadne, the daughter of Minos, his buxom wife: and [Zeus] the son of Kronos made her deathless and unageing for him." The bull, the serpent, ivy and wine were the characteristic signs of Dionysus. Their presence in Greek art signified that the god was near. Dionysus was also strongly associated with the satyrs, centaurs and sileni. He was often shown riding a leopard, wearing a leopard skin, or being pulled by a chariot drawn by panthers and has been called the god of cats and savagery. He always carried a thyrsus. Besides the grapevine and its wild barren alter-ego, the toxic ivy plant, the fig was also sacred to him. The pine cone that tipped his thyrsus linked him to Cybele, and the pomegranate linked him to Demeter. The Dionysia and Lenaia festivals in Athens were dedicated to Dionysus. Initiates worshipped him in the Dionysian Mysteries, which were comparable to and linked with the Orphic Mysteries, and may have influenced Gnosticism and early Christianity (see below). His female followers are called maenads ("mad women") or Bacchantes. The god's rebirth in both versions of his origin story is the primary reason that he was worshiped in mystery religions, which explored the liminal relationship between life and death as a matter of mystical reverence. In Athens and the Attica of the Classical period, the main festivities were held in the month of Elaphebolion (around the time of the Spring Equinox) where the Greater, or City, Dionysia had evolved into a great drama festival - Dionysos having become the god of acting, music and poetic inspiration for the Athenians - as well as an urban carnival or Komos. Its older precursor had been demoted to the Lesser, or Rural, Dionysia, though preserved more ancient customs centred on a celebration of the first wine. This festival was timed to coincide with the "clearing of the wine," a final stage in the fermentation process occurring in the first cold snap after the Winter Solstice, when it was declared Dionysos was reborn. This event was later explicitly set to January 6, a day on which water was also turned to wine by Dionysos in a separate myth. The festivals at this time were much wilder too, as were the festivities of the grape harvest, and its "carnival-esque" ritual processions from the vineyards to the wine press, which had occurred earlier in the autumn. It was at these times that initiations into the Mysteries were probably originally held. In sharp contrast to the daytime festivities of the Athenian Dionysia were the biennial nocturnal rites of the Tristeria, held on Mount Parnassus in the Winter. These celebrated the emergence of Dionysos from the underworld with wild orgies in the mountains. The first day of which was presided over by the Maenads, in their state of Mainomenos ("madness") in which an extreme atavistic state was achieved, during which animals were hunted - and, in some lurid tales, even human beings - before being torn apart with bare hands and eaten raw (this being the infamous Sparagmos, said to have been once associated with goat sacrifice, marking the harvesting and trampling of the vine). 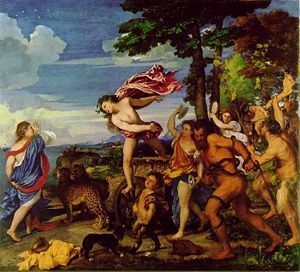 The second day saw the Bacchic Nymphs in their Thyiadic ("raving") state, a more sensual and benign Bacchanal assisted by satyrs, though still orgiastic. The mythographers would explain this with claims that the Maenads, or wild women, were the resisters of the Bacchic urge, sent mad, while the Thyiades, or ravers, had accepted the Dionysiac ecstasy and kept their sanity. Dionysos was also revered at Delphi, where he presided over the oracle for three winter months, beginning in November, marked by the rising of the Pleiades, while Apollo was away "visiting the Hyperboreans." At this time a rite of known as the "Dance of the Fiery Stars" was performed, of which little is known, but appears to have been conducted to appease the dead. When conducted under Roman auspices, the festival had earlier been confined to women, but in the grove of Stimula young men were being initiated into the cult, and there were allegations of both heterosexual and homosexual licence. Though previously restricted to three days a year, the ceremonies were now being conducted five times a month; moreover, the proceedings were being held in darkness. Allegations of dire misconduct were circulating, including charges of murder of unwilling initiates, forging of the wills of the dead, and perjury. In a more contemporary context, the Dionysiac rites are also thought to have informed the modern rites of Anastenaria, still practiced in the present day by Greeks of Thracian descent. Though some scholars dispute this interpretation, most are of the opinion that the fire walking accompanied by ecstatic dancing, drumming, and forays into the woods or mountains by participants "possessed by the saint," as well as the preliminary animal sacrifice and distribution of meat to the village population, are at their origin not the Christian rites they are constructed as by the villagers who perform them, but the rites of Dionysus. ↑ Jon D. Mikalson. Ancient Greek Religion. (Malden, MA: Blackwell, 2005), 92. ↑ Dana F. Sutton. Ancient Comedy. (Twayne Publishers, 1993), 2, mentions Dionysus as The Liberator in relation to the City Dionysia festivals. ↑ William Sherwood Fox. The Mythology of All Races. v.1, Greek and Roman. (1916), 221. Fox cites Euripides as a direct source for this statement. Euripedes. Bacchae, Choral II, lines 379-381:  "Holiness, queen of the gods, Holiness, who bear your golden wings along the earth, do you hear these words from Pentheus? Do you hear his unholy  insolence against Bromius, the child of Semele, the first deity of the gods at the banquets where guests wear beautiful garlands? He holds this office, to join in dances,  to laugh with the flute, and to bring an end to cares, whenever the delight of the grape comes at the feasts of the gods, and in ivy-bearing banquets  the goblet sheds sleep over men." Retrieved October 20, 2008. ↑ Xavier Riu. Dionysism and Comedy. (Rowman and Littlefield Publishers, 1999, Chapter 4, "Happiness and the Dead,"), 105, "Dionysus presides over communications with the Dead". ↑ John Paul Adams, Professor of Classics, 2005, Dionysos website. California State University, Northridge Retrieved October 20, 2008. ↑ Fox, 217, "The word Dionysos is divisible into two parts, the first originally Διος (cf. Ζευς), while the second is of an unknown signification, although perhaps connected with the name of the Mount Nysa which figures in the story of Lykourgos … when Dionysos had been reborn from the thigh of Zeus, Hermes entrusted him to the nymphs of Mount Nysa, who fed him on the food of the gods, and made him immortal". ↑ H. J. Rose. A Handbook of Greek Mythology. (New York: E. P. Dutton & Co., 1959), 149. ↑ Karl Kerenyi. Dionysos: Archetypal Image of Indestructible Life, trans. Ralph Manheim. (London: Routledge and Kegan Paul, 1976), 286. ↑ For an extensive catalog of the god's epithets (and their textual sources), please consult: theoi.com. Retrieved June 21, 2007. ↑ Barry B. Powell. Classical Myth, Second Ed. (Upper Saddle River, NJ: Prentice Hall, 1998), 244. ↑ See Powell, 244-246; Apollodorus, 3.26-29; Euripides, Bacchae 285; Ovid, Metamorphoses 3.304. ↑ Timothy Gantz. Early Greek Myth: A Guide to Literary and Artistic Sources. (Baltimore: Johns Hopkins University Press, 1993), 112-113, 741-742. While the first account is most common in mythological materials, the second was related to the theogonies developed by the Orphic (and other) mystery religions (Gantz, 741-742). ↑ Rose, 152; Homer, Iliad 6.129; Homeric Hymn 26 to Dionysus. ↑ Rose, 150-152; Powell, 246. ↑ Dionysus at Theoi.com. Retrieved June 21, 2007. ↑ Powell, 246-247; Gantz, 113; Apollodorus, 2.29; Euripides, Bacchae 70, 120. ↑ Gantz, 114; Ovid, Metamorphoses 3.696; Homeric Hymn to Dionysus VII (1-57). ↑ Hyginus Fabulae 166, quoted at theoi.com. Retrieved July 21, 2001. ↑ See the Bacchae of Euripides for more details. Summarized and quoted from at length in Powell, 253-270. ↑ Rose, 152; Powell, 250-251; Apollodorus, 3.34-35; Hyginus, Fabulae 132. ↑ Pausanias, Guide to Greece 2.37.6. Quoted at theoi.com. Retrieved July 21, 2001. ↑ While some of the above sources may appear critical of the god (or at least to be describing his cult as replete with bizarre observances), it is because the only complete versions of this story that remain extant are found in Christian sources (whose aim was to discredit pagan mythology). Indeed, it appears to have served as an explanation of the secret objects that were revealed in the Dionysian Mysteries. Hyginus, Astronomy 2.5; Arnobius, Against the Gentiles 5.28; Dalby, 108-117. ↑ Nonnus, Dionysiaca (X.175-430; XI; XII.1-117); Dalby, 55-62. ↑ Hesiod, Theogony 947, quoted by the article on Ariadne at Theoi.com. Retrieved June 21, 2007. ↑ For a clear and in-depth description of these rites, see Lewis Richard Farnell. The Cults of the Greek States. 1896. (Volume V, cf. Chapter IV, Cults of Dionysos; Chapter V, Dionysiac Ritual), 85-239.; See also: Mikalson, 91-98. The three paragraphs above have been taken (and adapted from) wikipedia. ↑ Livy, summarized by P. G. Walsh, "Making a Drama out of a Crisis: Livy on the Bacchanalia," Greece & Rome (2nd Series), Vol. 43(2) (October 1996), 188-203. 188. ↑ The Anastenaria: The Ancient Ecstatic Fire-Walking Ritual of Greeceanagnosis.gr. Retrieved October 20, 2008. Apollodorus. Gods & Heroes of the Greeks, Translated and with an Introduction and Notes by Michael Simpson. Amherst, MA: University of Massachusetts Press, 1977. ISBN 0870232053. Burkert, Walter. Greek Religion: Archaic and Classical, Translated by John Raffan. Oxford: Blackwell, 1985. ISBN 0631112413. Dillon, Matthew. Pilgrims and Pilgrimage in Ancient Greece. London; New York: Routledge, 1997. ISBN 0415127750. Farnell, Lewis Richard, The Cults of the Greek States. 1896. Volume V, cf. Chapter IV, Cults of Dionysos; Chapter V, Dionysiac Ritual; Chapter VI, Cult-Monuments of Dionysos; Chapter VII, Ideal Dionysiac Types. Fox, William Sherwood, The Mythology of All Races. v.1, Greek and Roman. 1916, General editor, Louis Herbert Gray. Gantz, Timothy. Early Greek Myth: A Guide to Literary and Artistic Sources. Baltimore: Johns Hopkins University Press, 1993. ISBN 080184410X. Graves, Robert. The Greek Myths. (Complete Edition). London: Penguin Books, 1993. ISBN 0140171991. Jameson, Michael. "The Asexuality of Dionysus." Masks of Dionysus, Ed. Thomas H. Carpenter and Christopher A. Faraone. Ithaca: Cornell UP, 1993. ISBN 0801480620. 44-64. Kerényi, Karl, Dionysos: Archetypal Image of Indestructible Life, trans. Ralph Manheim. London: Routledge and Kegan Paul, 1976. Mikalson, Jon D. Ancient Greek Religion. Malden, MA: Blackwell, 2005. ISBN 0631232222. Pickard-Cambridge, Arthur. The Theatre of Dionysus at Athens. 1946. Ridgeway, William, Origin of Tragedy, (original 1910) reprint ed. Kessinger Publishing, 2003. ISBN 0766162214. Parke, H. W. Festivals of the Athenians. Ithaca, NY: Cornell University Press, 1977. ISBN 0801410541. Powell, Barry B. Classical Myth, Second Ed. Upper Saddle River, NJ: Prentice Hall, 1998. ISBN 0137167148. Ridgeway, William. The Dramas and Dramatic Dances of non-European Races in special reference to the origin of Greek Tragedy, with an appendix on the origin of Greek Comedy. 1915. Smith, William. Dictionary of Greek and Roman Biography and Mythology. 1870, article on Dionysus, ancientlibrary.com. Rose, H. J. A Handbook of Greek Mythology. New York: E. P. Dutton & Co., 1959. ISBN 0525470417. Seaford, Richard. Dionysos (Gods and Heroes of the Ancient World). Oxford: Routledge, 2006. ISBN 0415324874. Sutton, Dana F. Ancient Comedy. Twayne Publishers, 1993. ISBN 0805709576. Ventris, Michael & John Chadwick. Documents in Mycenaean Greek, Second Ed. Cambridge: Cambridge University Press, 1973. ISBN 0521085586. Walsh, P. G. "Making a Drama out of a Crisis: Livy on the Bacchanalia." Greece & Rome (2nd Series). 43(2) (October 1996); 188-203. All links retrieved October 21, 2017. Theoi Project, Dionysos myths from original sources, cult, classical art. History of Rome, Book 39:13, Description of banned Bacchanalia in Rome and Italy. Albert Henrichs, Between City and Country: Cultic Dimensions of Dionysus in Athens and Attica, (April 1, 1990). Department of Classics, UCB. Cabinet of the Muses: Rosenmeyer Festschrift. Paper festschrift18. This page was last modified on 21 October 2017, at 21:45.